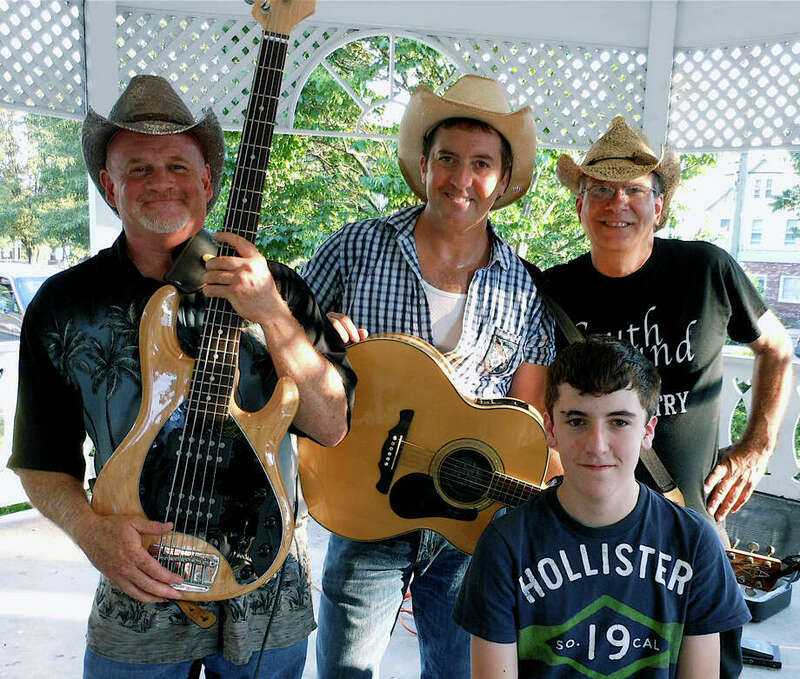 The country music band Southbound -- Dave Cobb, Lou Lomangino, Stevie Lomangino and Mike DeLuca -- performed Sunday night at the Sherman Green gazebo. With temperatures near the 90s, cowboy hats were sprinkled through the crowd and a whole lotta two-steppin' going on Sunday evening at Sherman Green. The Texas-meets-Fairfield vibe on a sultry summer night was courtesy of Southbound, a country music band performing at the downtown green's gazebo. The performance was part of the summer-long series of concerts organized by the town's Parks and Recreation Department. The Long Island-based band laid down tunes like "Take Me Home Country Road" and "Fulsom Prison Blues" to the delight of over 100 people who gathered for the event. The musicians included Dave Cobb, bass; Lou Lomangino, vocals/guitar; Stevie Lomangino, drums, and Mike DeLuca on banjo, pedal steel, mandolin, fiddle and dobro. Adding to the fun was Pete Jeson, a line dance instructor who travels with the band and gives lessons to those interested in two-stepping along to the melodies. "We came to meet up with old friends and enjoy the weather, which is a little cooler tonight," said Cory Paniccia of Easton, whose toddlers Sebastian and Isabella jumped into the line dancing group. Jennifer Landgraf of Fairfield said the Sunday concert served to "make the weekend feel that much longer." And, she added, "Our kids love music." For the Brockmeyer family of Fairfield the event triggered memories. "We're from Houston originally," said Rich Brockmeyer. "We like to keep in touch with our southern roots. It's nice Texas weather we're having today." The Brockmeyer weren't the only southern-born folks in the audience. "This is like a little piece of home," said Kayla McLeod, originally from Nashville but now living outside Philadelphia. "When you walk down Broadway in Nashville, it sounds like this coming out of all the bars."